Maggie Kunze and Sarah Foote, Ellipses, flashing LED lights and fishing line, 2018. Image courtesy of the artists. The echo of a landscape, twinkling lights, and fragmented refrains. What is appearance and what is reality? In Tilting at Windmills, viewers were led to ponder this question and discover the awakening of their respective imaginations as they contemplated new works created by Maggie Kunze and Sarah Foote. Partly inspired by an excerpt taken from Miguel de Cervantes’ novel Don Quixote, one couldn’t help but be pulled into Kunze’s poetic tableaus and Foote’s layered compositions as each piece bounced color, poetry, and geometry back and forth in a magnetic labyrinth created by the artists. Maggie Kunze, Sublime Scraps No. 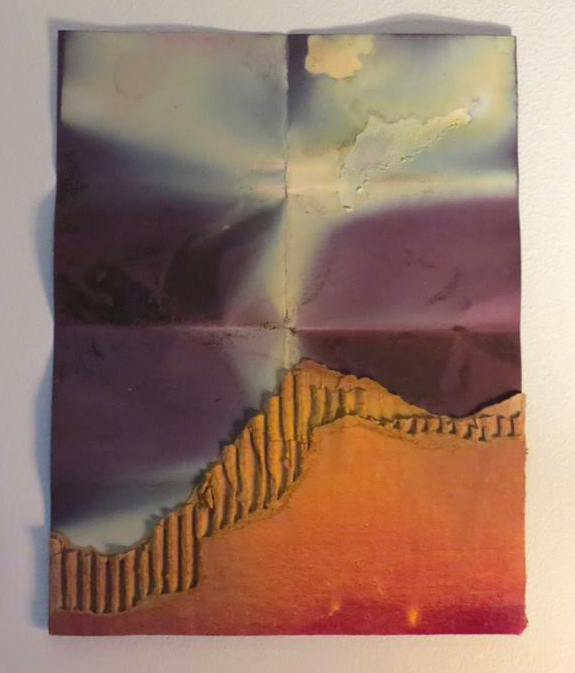 1, dyed paper, spray paint, and cardboard, 2018. Image courtesy of Hannah Carnes. 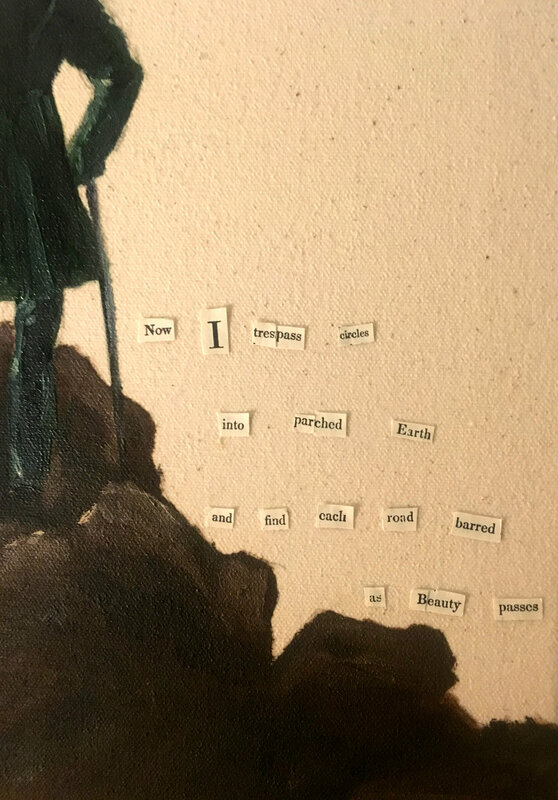 Maggie Kunze, The Wanderer - After Friedrich and Whitman, oil and collaged paper taken from Walt Whitman's "Song of Myself" on canvas, 2018. Image courtesy of the artist. Through the combination of linear and organic forms, together their work reflected the complexities found within nature, literature, and the world as it has been and will continue to be shaped by human interaction. Hung within the main living space of Foote’s apartment, the two artists forged a sense of mystery and asked guests to use their own lived experiences to unravel the meanings to be found behind the work as individual units and as a united whole. Sarah Foote, Untitled No. 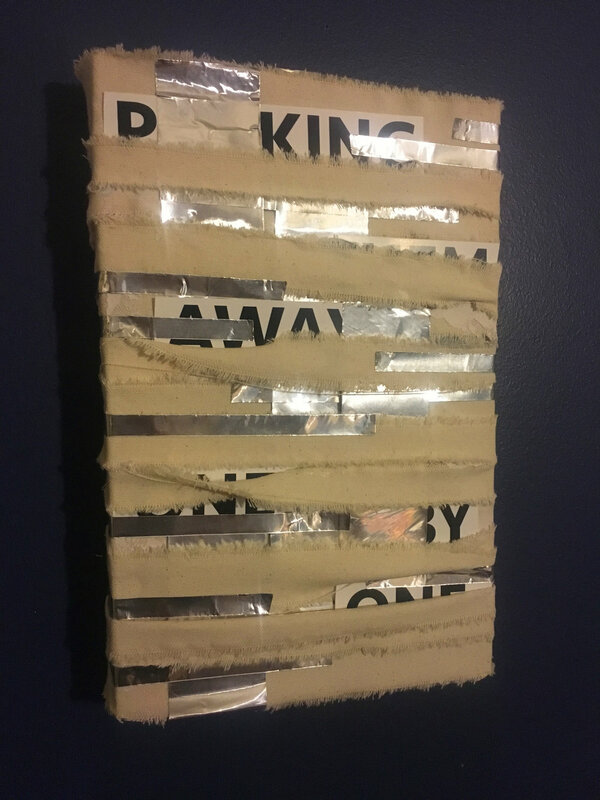 1, canvas and aluminum, 2018. Image courtesy of Hannah Carnes. Sarah Foote, Untitled No. 2, canvas and aluminum, 2018. Image courtesy of Hannah Carnes. Within the warm, domestic interior, Kunze and Foote ultimately enveloped their guests in a story of their own creation and fully exhibited notions of the sublime and the beautiful. It was a pleasure to be invited into the space and to witness their work as both an outsider and insider. Certainly, Tilting at Windmills will stick in my memory as the adventure continues somewhere in the great beyond. Maggie Kunze, Corner, oil and acrylic on canvas, 2018. Image courtesy of Hannah Carnes. Maggie Kunze, Light Composition No. 1 (Detail), acrylic on canvas, 2018. Image courtesy of the artist. Jessica Tackes is an artist, writer, and historian who will earn her BA in Art History and Drawing from Illinois State University in 2018. Tackes currently lives and works in Rockford, IL. Her writings have been published by Sixty Inches From Center.